Danny Federici now has company, as another E Street member has joined him in the great beyond. I knew it was possible with the announcement of his suffering a major stroke just a short few days ago, but it doesn't change the sadness I feel at rock music losing maybe the lost true great sax player to the great beyond. A guy who added his tremendous skills to records by Ronnie Spector, Jackson Browne, Aretha Franklin, Joe Cocker and, yes, Bruce Springsteen among many other classic musical artists over the last Forty-odd years. With a tenth avenue freeze-out..."
Back in April of 2009 I went to see Bruce Springsteen & the E Street Band at the Glendale Arena, oh excuse me, "Jobbin.com Arena." Anyhow, it had been a long time coming, as I had been wanting to see a show of theirs since they re-formed in the late 90's. However, the tours weren't exactly often, and they also weren't always cheap. At the end of the near-three hour show, just as I had found Springsteen & the E Street Band's recent release 'Working on a Dream,' I found myself disappointed. I truly think having seen Bruce solo on the 2005 'Devil's & Dust' tour or the 2006 'We Shall Overcome' tour with the Seeger Sessions band would have been more fulfilling. The show had some high highs, but also found itself with some low lows as well. It saddens me that the Big Man, seemingly the last in the long line of great saxophone players going back to the likes of Louis Jordan, Charlie Parker, King Curtis, Steve Douglas and Jr. Walker is now, too, gone to another place. The end of such a prestigious long line of musical history. It also saddens me his last work was with Lady Gaga. It's not the fact I found that album utterly terrible, no, in fact I applaud her for bringing in someone with actual music integrity to play, just that I fear that as his last legacy, the last images of him performing something so below his more than obvious talents. Bruce Springsteen...Ronnie Spector...Scarlet Rivera...Ian Hunter...Ringo Starr...Aretha Franklin...Roy Orbison...Joe Cocker...Lady Gaga? 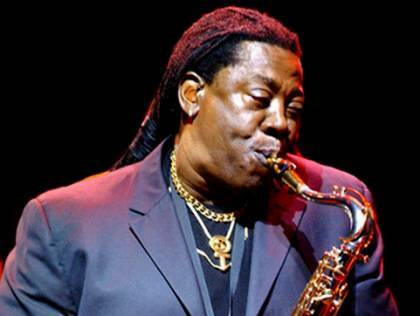 If his playing on that record and appearing on a recent show with her get people look deeper into his catalogue, I'm all for it, I just want people remember Clarence for what he was: A Loving soul and a man who could turn the spotlight on him with just a simple reed and saxophone. A testament to him? 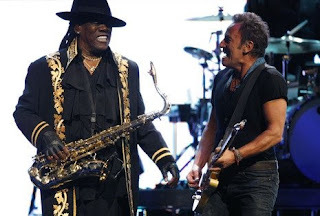 When I think of some of Springsteen's best known non-solo work: "Born to Run," "Rosalita," "Spirits in the Night," "Badlands," "10th Avenue Freeze-Out," "Radio Nowhere" or "Livin' in the Future" I think of Clarence Clemons and his sax work and what it adds to the song, just as much as I would think of the writing or Springsteen's almost distinctive voice. One of my all-time favorite Dylan covers is Springsteen doing "I Want You" in the mid-70's, and why? Well, the piano and Clarence's sax add something tremendously unique to the song. A man that truly left his mark. I highly recommend checking out his autobiography, 'Big Man: Real Life & Tall Tales," which came out just a couple years ago. Also, I recommend picking up the live two-disc set 'Hammersmith Odeon London '75,' by Bruce & the E Street Band, a wonderful live representation of what he could do live on stage.